I'll admit it. The title got me. As I was perusing the picture book shelves at my local library, this book jumped out and grabbed me - and wouldn't let me go. Cuz who hasn't thought this at some point?? The best part? Reading (and looking at) the book kept me in that zone. Absolutely. And so, I present to you another fabulous book to add to Susanna Leonard Hill's Perfect Picture Book Friday list. Title: I Need My Own Country! First Page: There comes a time in all kids' lives when they need to create their own country. Synopsis: When in the course of childhood events, it becomes necessary for one (small) person to create a separate and equal hiding spot to which the laws of growing up entitle them, the truth will be self-evident: they should declare their very own country! -this picture book offers a hilarious lesson in junior civics that shows every budding future-president exactly how he or she can create a very special place all their own. Resources: There are some great ideas for creating a country and other related topis at the International Literacy Association page for this book. Why I LOVE it: First of all, it is EXACTLY the kind of book I would LOVE to be able to write. The words and the illustrations absolutely, positively depend on one another. It isn't a comprehensible book as only illustrations - or as only text (at least, you wouldn't get the whole message). I am ABSOLUTELY studying this one as a mentor text. Plus, it's quite funny - both the illustrations and the text. And it's super creative. And it is a VERY fun way to introduce young kids to government. So much fun and I remember doing projects like this at school. Me too, Joanna. This book is lots of fun. Thanks for stopping by! 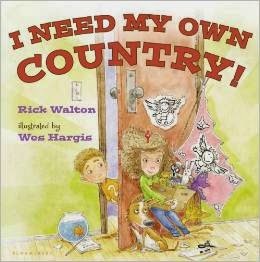 Creating your own country is a fun idea for children -- a step up from the tree houses, forts, hiding spots etc. that we had as a child. Like the humor. I would have loved this as a child. Me too, Patricia - especially with four brothers LOL. A "no boys allowed" country LOL. Ha ha. Your synopsis cracked me up! I'm definitely going to check this out. I'm sure you'll love it, Joanne - the synopsis, if I recall, is from the inside book jacket. Thanks for stopping by! What a clever concept! Thanks for sharing this one, Joanne. My pleasure, Wendy! I'm about to type it up and probably dummy it (and take copious notes :D). Thanks for stopping by! What a great book for social studies lessons for kids. I am going to have to find this one! Absolutely - and with FUN. I'm sure you will enjoy it as much as I did, Joyce! Thanks for stopping by. Great review - and yeah, I want my own country, too. Definitely putting this on my to read pile. Thanks, Sue - this one is definitely a keeper. Thanks for stopping by! This sounds terrific, Joanne! I too am sold on the title alone! Thanks so much for adding this one to our list - I will have to check it out!